"It is time to go home comments." I believe I have a heightened self-awareness when I visit Africa, like being in solitary confinement; I am forced to remember all the angels and demons in my life. I have an abundance of free time, there is more time than normal in Africa for me to think. Ergo, I am more self-aware, and introspective life is easy. 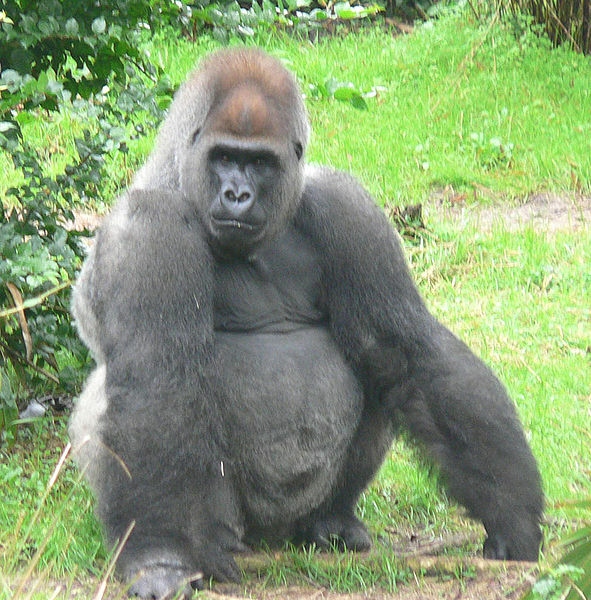 A big Alpha Male Gorilla is always watching me; there is no hiding in Africa. Either he is ready to swat me to behave or takes me under protective care. I think I come across as a loner; however, this is not true, I am an extreme extrovert that does not need the approval of people to be happy. I believe the one experience that prepared me for travel was spending one year on house arrest, this truly honed my ability to deal with the emotional situations of travel. When you come face to face with who you are, you will fall in love with the person in the mirror, or break the mirror. I fell in love with the man in the mirror and went forth to become the hero of my own life, a person I truly respect. I was self-aware until one day I became satisfied in the knowledge learned; there is no problem in life that does not have a solution. If in doubt, just sit down until the problem passes. "Take care when you reach the edge of the earth, because there be dragons." "Africa is DOS, America is Windows." Without DOS, Windows cannot function; we need our basic life skills to function. I can see how the essential life skills function first hand here in Africa. Africa is emotions, feelings and understanding at the first level of emotional management. I believe in Africa I can experience at the machine level, how humans think, how humans feel and deal with the normal problems of life. I was forced to face many demons, it is question mark in my mind whether anyone does this of their own free will, it takes unavoidable challenges to find the demons and conquer them. Africa allows me to see the demons and angels running around in humans, there are no complicated layers of wrapping around Africans, for the most part, what you see, is what you get. Hmm, I just thought of a way to explain the primitive mind of man, he or she is full of sin, it is like watching beggars. They are an intriguing bunch, full of unexpected responses, it is not wise to get too close to beggars, you may find unbounded love, or get bitten very hard. This is Africa one day I am licking my wounds from some emotional bites, and the next I feel grateful for the love and attention, that must be paid for in cash or gifts, there is nothing for free in machine level Africa. I am very happy today, I have two new plans, two paths have been revealed. I gave up on the country Cote d’Ivoire for now, the leaders are idiots, small children with guns. I go meet Cote d’Ivoire Girl at Ghana / Cote d’Ivoire Border. 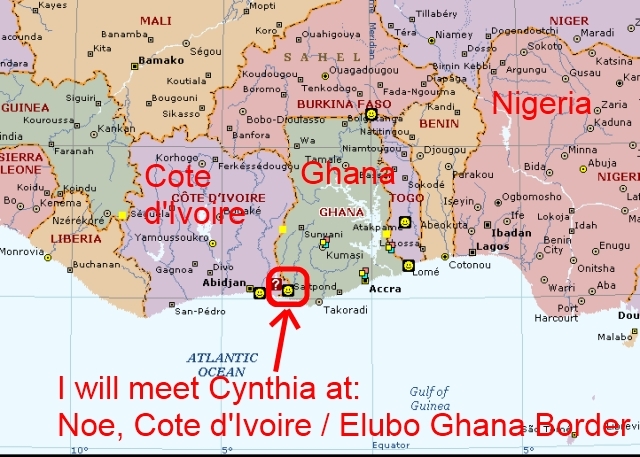 Yesterday, Cynthia called the USA, which then forwards to Ghana, and I pick up on my cell phone here, truly, I can receive calls anywhere on the planets. She e-mailed me the moment I left Cote d’Ivoire and has been calling me every week since I left, about seven weeks in a row. This girl is amazing, about the same as Naomi here in Mampong, but the older full on woman version and speaks French, a student in Abidjan, Cote d’Ivoire. What is amazing is this, calling the USA from Cote d’Ivoire is expensive on a cell phone, maybe one dollar or more per minute. I can give Africans my USA telephone number with no fear; they will not pay the money to call. Cynthia has paid seven times, and now she says she is coming to Ghana, I am supposed to meet her at the Elubo / Noe Border. I am excited to follow the path with another person for a couple of weeks, we can go to Cape Coast, and she can experience up close and personal a slave fort. I took a Ghana girl there years ago and she cried, when the reality hit home. I want to experience a feat of human bravery, for Cynthia a 28-year-old girl (A lie) to come alone is about the same as me going to Nigeria and onto South Africa alone. Will she actually make the trip, or will she come up with some last minute excuse. 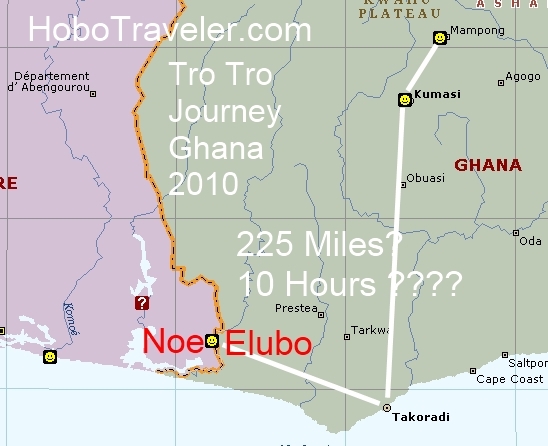 I am going to take Tro Tros, the small vans from Mampong to Kumasi, change, the from Kumasi to Tokoradi, change, then from Tokoradi to Elubo. I will then wait at the border in some dive hotel for her to call me from Noe, when she feels confident, she will cross and meet me. Good fun, as the Brits say, this is a gamble, I am guessing, there is a 30 percent chance she will actually show up in Noe. Either way, I do not like Ghana, I love Cote d’Ivoire and Togo, I need to change channels, and this is one way to change. Bottom line, I am taking a round about path toward Accra to get a Visa to Nigeria, then back to Togo, onto Benin, enter Nigeria and get a visa to Cameroon in Calabar, Nigeria. I normally black hole girl situations, but this feat of bravery by Cynthia needs explained and documented. She is making a leap into the unknown, for many reasons, which are unknown to me, it is not fear, it is bravery. Many people do things because of fear or greed, bravery is rare and a bright star of emotions. I take pause and observe, truly a great thing to experience.